Moving to more refined requests with our horses is where we all want to be, using strategies such as ‘Undemanding Time’, ‘Mirroring Your Horse’, ‘Stick 2 Me’ and having ‘Awareness & Focus’ with ‘The Connection’ we should find that we are becoming more harmonious with our horses, the ‘dance’ is starting. How do we refine the moves we already know? How do we make non-personal, non-threatening requests to a horse? 1) SHARING SPACE: This is where I ask a horse to be close with me on a shared mutual path. Sometimes this may mean the horse is following me, sometimes I am following the horse but eventually I have found that we start being together in a mutual dance of understanding. I use this sharing space method of connecting in my ‘STICK 2 ME’ training which is talked about in another article. 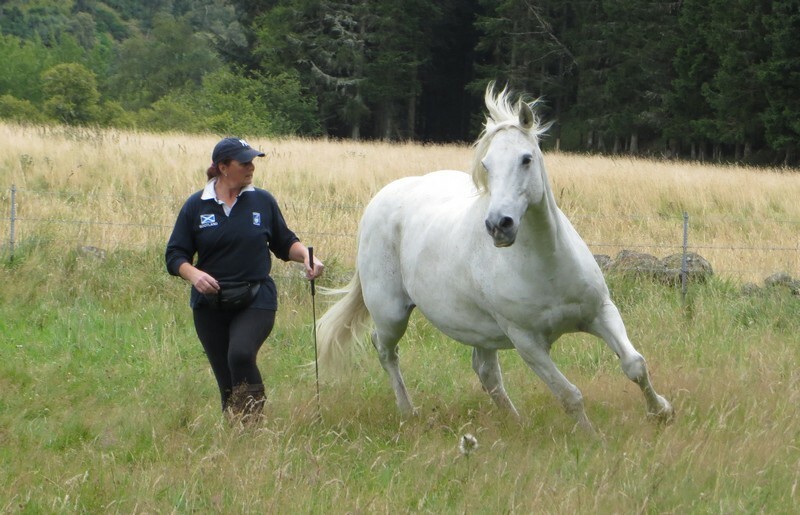 2) PROTECTING SPACE: This is where I set up and keep the space distance between me and my horse(s) as we walk or keeping the space that is around us within a herd situation. If another horse comes up that I am not working with I will protect the space me and my horse are in from others and often when working with two horses at once I protect my space, the space of the horse to my left and also the one to my right individually so that there are no other herd dynamics going on between them and whilst they are with me they both know that I will protect their space so that we can all relax in a peaceful environment. If horses of different levels in the herd hierarchy are working with me at one time I let them know I am alpha by protecting my own space well and they are all then on the next level down but none of them higher or lower than each other, just me above only, that way they can relax and listen to my requests without worrying about being moved by the other horse. 3) CLAIMING SPACE: If the space I create with a horse is changed by that horse moving in to me, thereby taking my space, I reclaim the part I have lost. I also use this claim of space to ask for transitions, I claim the space behind them so that I am not telling the horse to move faster ‘or else’, I am just claiming the grazing under their back feet, this is less bossy and a way herd members move others without being dominant. Being aware of the space I set up at all times helps make me mentally strong in the herd. 4) SHAPING SPACE: I try to get my own body to create a shape that I ask the horse to copy, once the space between us is understood a horse will very usually bend or move the way we ask and copy our own energy levels to remain synchronised in the herd ‘dance’. Working with this on the ground first helps both parties to create that shape and then recreate it when riding. Shaping space can get very refined, sometimes I ask the horse to just move one part slightly differently to create the shape needed for a move, such as moving the barrel just a small bit away from me to create a better arc in the whole of his body to help with turns and circles. This sort of shaping involves mentally and physically claiming the small area back from the horses space or bubble. 5) OPENING & CLOSING SPACE: I mentally open area’s that I would like the horse to go into and as those spaces open I close others mentally to shut off where I don’t want us to go. This can be refined and very specific in such things as gait, speed of gait, lateral moves but starts with just the basics of left, right, forward, stop and backup. 6) BLOCKING SPACE: I use a ‘block’ if a horse comes into my space without asking or tries to take my space by walking into it. This does not mean I don’t allow horses to play or have their own ideas but sometimes with some horses we need to re-direct their thoughts to something we’re trying to teach them or to block and protect our space if they get high energy at an inappropriate time. When using space shaping techniques I make sure that I check myself regularly to see if I am asking something of the horse that I am truly showing in my own body because if we don’t ask the right question or ask the question right in our thoughts and body then the result won’t be what we thought it would be. With new requests I tend to exaggerated my body movements to help my horse see the shape I’m making but once the horse understands that can quickly be refined into more elegant movements. Also I use a mental image of me in a personal space ‘bubble’, the horse in its own personal space ‘bubble’ but those bubbles are touching when we’re connected and I can change that bubble diameter for draw/drive or to have the horse closer or further away. I know it may sound farfetched but if you work visually then having these kinds of pictures in your mind helps the connection as it defines the space you’re in better so that the horse can pick up on that intuitively. Once I’ve sorted this all in my brain it comes instinctually and I don’t have to mentally ‘think’ about it in such detail. My main thoughts would be on where we’re going, what gait and if we’re shaping correctly for the movement we’re doing also I’m constantly reminding myself of ‘what I am trying to achieve’ with each movement/shape. Thinking on this ‘bubble’ connection we must not think of our horses running off when at liberty if they have a yeehaa moment, they are always connected to us, our bubbles just have to extend to accommodate the space between us, they forget we can’t ‘play’ like they can. If we think or feel disconnected it is US that has disconnected not them. They don’t think about us not keeping up with them, they’re just playing, so keep ‘mentally’ connected, recall them or keep the connection until you are closer. On that note you must remember to ‘disconnect’ when leaving them to go home. It really is all about ‘Space’, how much is between us, is it mutually shared, is personal space understood, are there still claiming space issues from your horse or are you in control of your space? Horses really do learn to read our thoughts as our thoughts shape our bodies without us realising it SO make sure you are fully aware of what your body shapes are conveying to your horse and once you find that harmony within space then just ‘dance’ together.